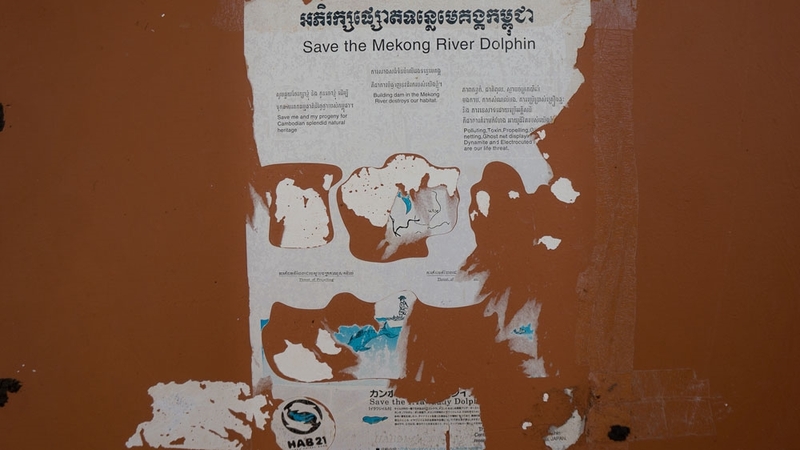 Kratie, Cambodia – At the dolphin ticket office there is a tattered page stuck to the wall calling on readers to save dolphins as part of “Cambodia’s splendid natural heritage”. It says, “building dams destroy habitats” and lists threats to dolphins, including pollutions and gillnets. It looks like an insect-eaten papyrus. The Irrawaddy dolphin is a critically endangered species. 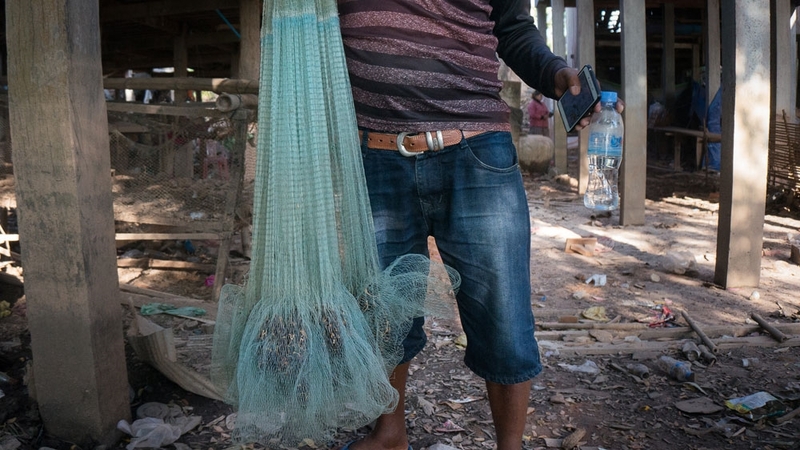 The largest of the five remaining population groups lives here, in a stretch of the Mekong River near Kratie (pronounced Krah-che) in northeast Cambodia. The government and the World Wildlife Fund (WWF) estimate there are currently 92 dolphins nearby – a slight uptick in the steady decline since 200 were counted in 1997. They surface like submarines as the sun sets, turning the sky blood red and gold. They expel water from their blowholes, sounding like disgruntled horses. On the bank, Sey Inn clasps his hands behind his back, watching the scene. He was born in Kratie in 1945. There are no estimates of the number of dolphins killed during the war. 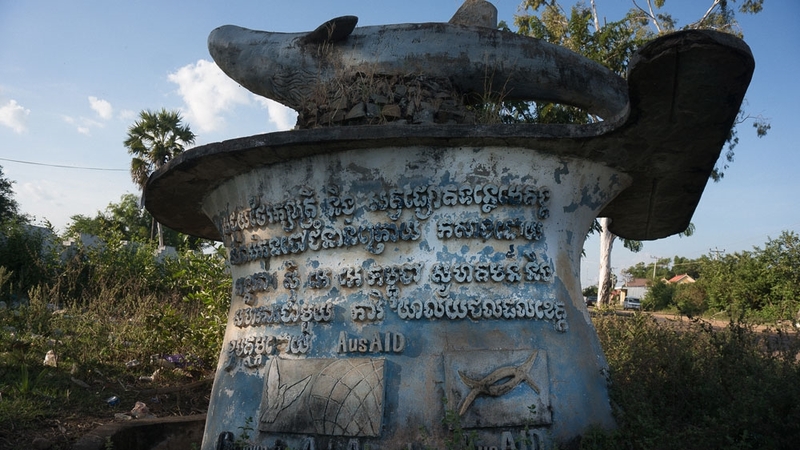 US forces thought Vietcong supplies were travelling via the northern Mekong and unloaded “2.7 million tonnes of explosives between 1964 and 1975”, according to a study on the “demographic collapse” of the dolphins by the Hawaii Institute of Marine Biology. The “audio trauma” from the explosions may cause death and the “interruption of feeding, breeding [and] nursing”. Noisy disturbances continue today as tourist boats congest the surface of the river where the Kratie population feed. “When they see the boat, the dolphins pyeeuu!” says boat driver Sun Kung, miming an animal in flight. Some tour guides now offer kayaking as a safer alternative. 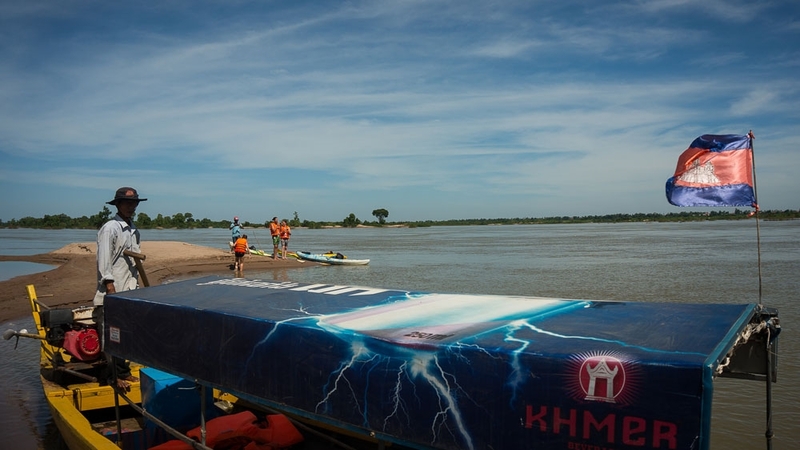 Dieb Socheat, known as “Lucky”, owns a kayak tour company in Kratie. Lucky says the increase in dolphin numbers, from 80 to 92 individuals in two years, is due to awareness campaigns by NGOs and government. However, some people still dangle live jump leads in the water, electrocuting mass numbers of fish. Savuth Dong, chief of the provincial department of environment of Kratie Province, is concerned. 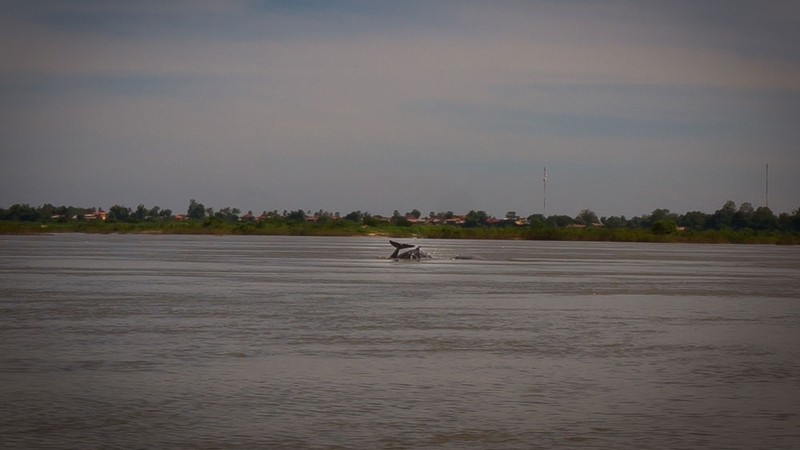 But there won’t be fish for the dolphins or locals if a dam gets built north of Kratie, according to analysts. The [dolphin] population may become locally extinct from the Mekong River. The Sambor Hydropower Dam is currently in the planning stages, a joint venture of the Cambodian government and the China Southern Power Grid Company. It would be 18km wide, create a reservoir 82km long, and bisect “perhaps the largest annual migration of fish biomass on the planet”, according to a report by the Natural Heritage Institute (NHI), tasked with assessing alternatives to the dam. It would be capable of generating 2,600 megawatts of electricity, just over the current consumption of the whole country. This ought to create a surplus of energy for export – a good money spinner for this lower-middle-income nation. 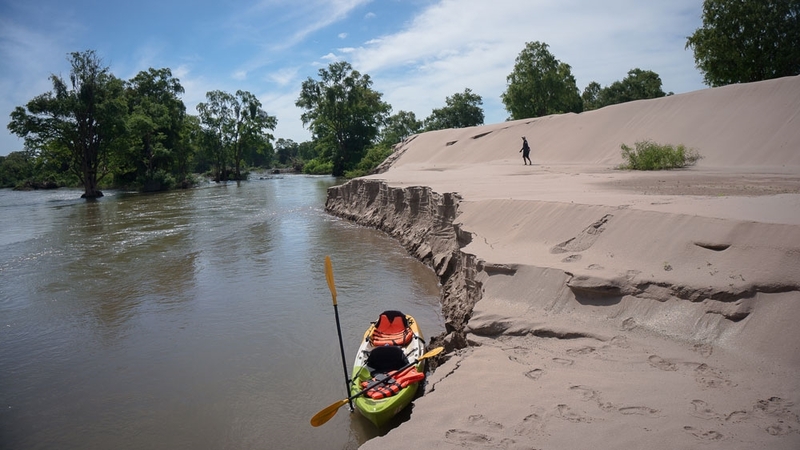 However, disruptions to fish spawning grounds and the “capture of most sediments and nutrients that maintain and replenish the morphology of the Mekong Delta and nourish the food web”, could have devastating effects, the NHI report says. There will be “a cumulative decline in harvestable biomass below the dam in the range of 45 percent”. 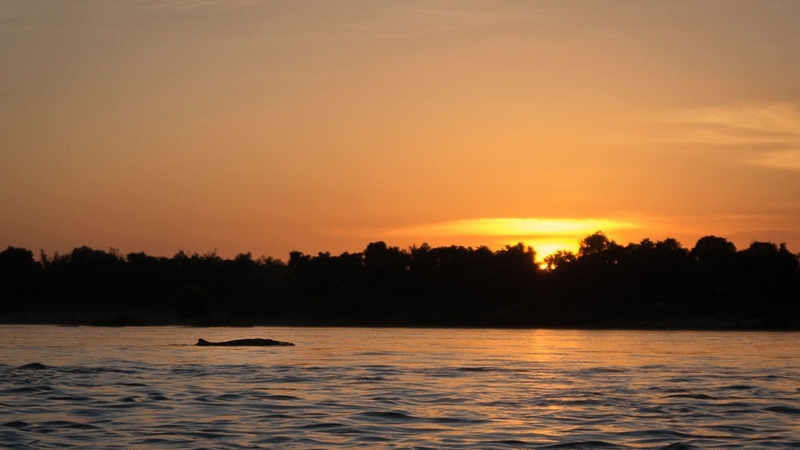 As for the dolphins, “the population may become locally extinct from the Mekong River,” the report adds. 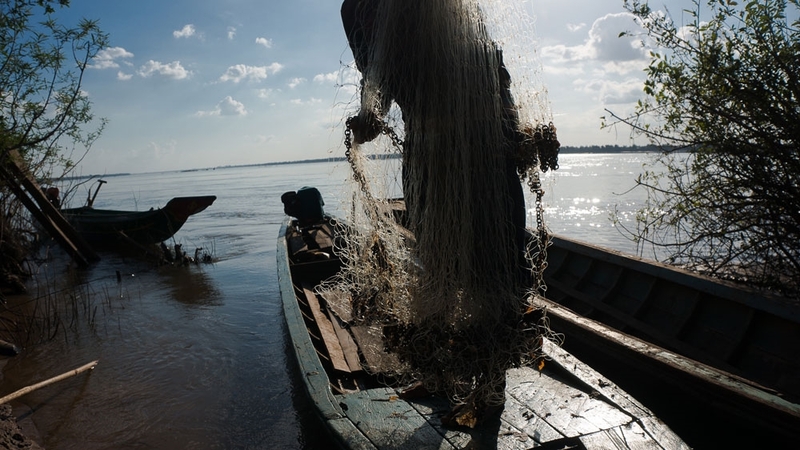 Fish makes up about 20 percent of the Cambodian diet and 80 percent of animal protein intake, according to WWF. As for the society and the economy, the estimated toll from the Sambor dam and others planned in Laos will likely be in the billions. Ministry of Environment spokesperson Neth Pheaktra declined to comment on the Sambor dam. Savuth Dong, a former fisher himself, can only wait for the higher-ups to take a decision. “The dam will impact the dolphins and fish,” he said, adding that he would prefer an alternative means of generating electricity. NHI presented a solar power alternative to Sambor dam to the Cambodian government as part of its report. But director Gregory Thomas says the solution is blocked. 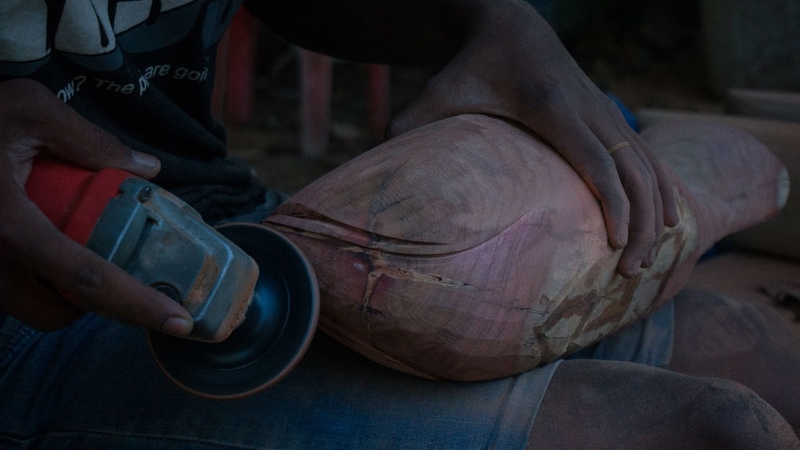 There is a profound disconnect between responsible resource management and alleviating poverty. This takes a heavy toll on fresh-water dolphins. Investors would need to receive a higher tariff to justify their investment in the solar power plant, he says. And second, Electricite du Cambodge, which would buy the power from the plant’s Chinese owners, is sceptical. “[They are] concerned about the effects of integrating this power on the stability of the national grid,” Thomas says. The Cambodian Ministry of Mines and Energy (MME) is revising its power sector master plan for approval by Prime Minister Hun Sen in early 2019. The solar power plant alternative “will probably not be on that revised master plan”, Thomas adds. Victor Jona, director general of the MME, says the government is giving “due consideration of the environmental aspects” associated with the Sambor dam proposal. 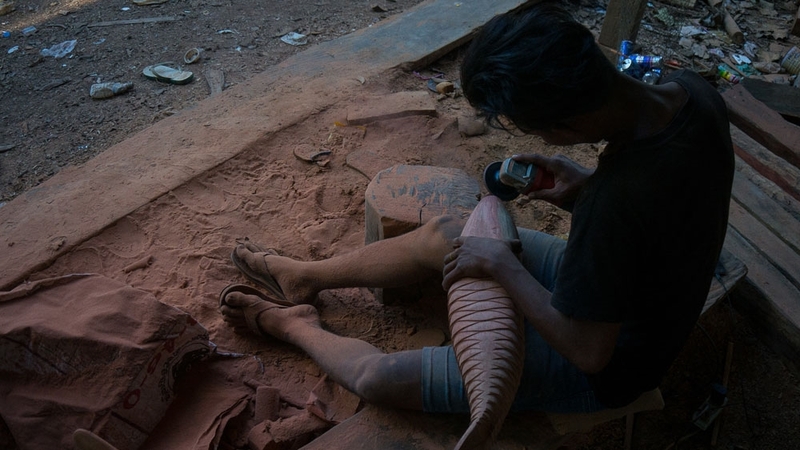 The term “development” can mean different things in Cambodia. NGOs and United Nations agencies equate it with liberal democratic values such as empowering women, improving education. The government and investors see it as creating in Cambodia the kind of wealth and lifestyle enjoyed by so-called developed nations. The boat drivers in Kratie total-up the day’s takings. Together they took 20 boatloads of tourist out to see the dolphins. They were easy to find now the rainy season is over. They are sheltering in a few deep pools in the riverbed as the dry season rolls in, scorching the banks and shrivelling the river. Yellow vest protests: Who are the ‘far-right element’ abusing MPs outside parliament?